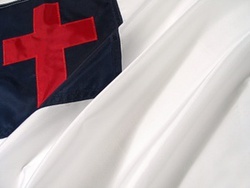 The Christian Flag was designed in the early 20th century to represent all of Christianity and Christendom. The flag has has a white field, with a red Latin cross inside a blue canton. The white represents Jesus' purity. The blue represents the waters of baptism as well as the faithfulness of Jesus. The shade of red on the cross symbolizes the blood Jesus shed on Calvary. Made by FlagZone, available in indoor and outdoor varieties in a number of different sizes.